When looking at Hall of Fame rookie cards for the NFL, it is easy to get disheartened by the high prices and overall condition for many of the cards. However, there are still some deals to be found, especially in the 1980s. We take a look at 20 of the top budget options among Hall of Fame players who had their first NFL card debut in the 1980s. "Budget" may be a term this is used a little loosely these days, but the list below was compiled based on very specific stipulations. Every card on the list can regularly be found for $50 or less, and we are not talking about low-grades or beat-up cards. The $50 or less price constraint applies specifically to PSA or BGS 9 grades, so not only does it include elite players, but it also deals with mint cards. Obviously some are more expensive than others, but more than half of the cards can normally be found for $25 or less with a BGS/PSA 9 grade. Because they are all in the Hall of Fame, the 20 names on the list should be very familiar to collectors and fans. When available, the players and products referenced are linked directly to detailed profiles. Also, while he is not officially in the Hall of Fame yet, Tim Brown also deserves recognition as a great budget HOF option. 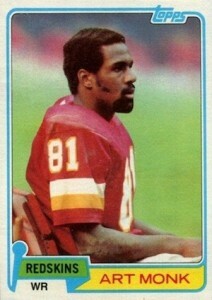 One of the top wide receivers of the 1980s, Art Monk played the majority of his career with the Washington Redskins, winning three Super Bowls and making three Pro Bowl appearances. Despite being the oldest card on the list, Monk's 1981 Topps rookie is a very affordable addition to any collection. Offensive line is not a glamorous position and collecting interest is normally minimal, at best, for those that battle in the trenches. However, Anthony Munoz is widely considered to be one of the best offensive lineman in NFL history and his 11 Pro Bowl selections can attest to that. His rookie in 1982 Topps was part of the first Topps set that was allowed to include helmet and team logos in over a decade, and this is a clear boost for the overall look of the card in comparison to the generic feel of previous releases. A huge part of the famed "Monsters of the Midway" defense for the Chicago Bears in the 1980s, Mike Singletary was a ten-time Pro Bowl selection and was vital during the team's 1985 title run. 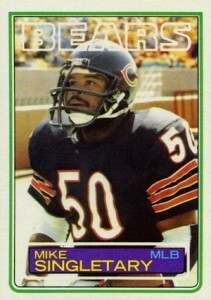 The 1983 Topps rookie card for Mike Singletary shows the continued evolution of the Topps design and offers a distinct look. Marcus Allen was an elite running back that never seemed to get his fair share of the praise you would expect for a Hall of Fame player. Allen appeared in six Pro Bowls and was the Super Bowl XVIII MVP. Despite his many accolades, Allen's 1983 rookie card is still found for very reasonable amounts. 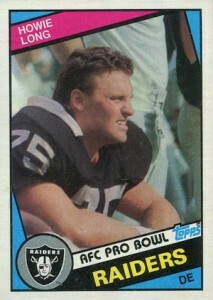 The first of several appealing rookie options in 1984 Topps, Howie Long is a popular defensive end from the 1980s and earned eight trips to the Pro Bowl along with one Super Bowl win. A member of the Raiders his entire career, Long's rookie card utilizes an odd color combination of pink and blue. 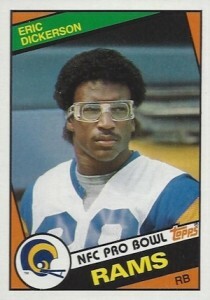 Eric Dickerson went to six Pro Bowls, led the league in rushing four times, and still holds the single-season record for rushing yards in a season, but it is hard to look at his 1984 Topps rookie card and see anything other than those large goggles. Dickerson's best years were split between the Los Angeles Rams and Indianapolis Colts. Renowned for his world class speed, Darrell spent his entire 20-year career in Washington, earning seven Pro Bowl nods and two titles, and is remembered as one of the best defensive backs of all-time. While the card colors work nicely in his 1984 Topps rookie, the haze in the background can be distracting. A prolific passer in both the CFL and NFL, Warren Moon was a nine-time Pro Bowl selection while suiting up for several teams. 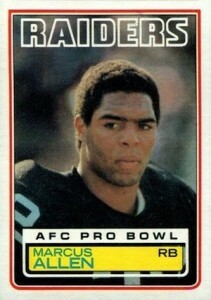 His NFL rookie is found in 1985 Topps, a set well known for sensitive black boarders. This actually makes Moon's rookie the most expensive card on the list in high grade. 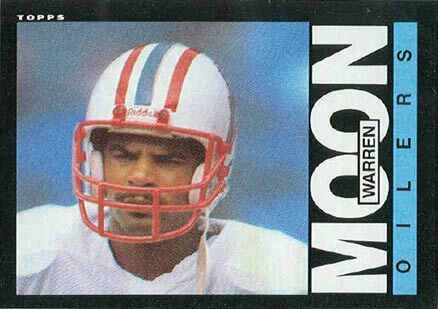 Warren Moon also has more valuable Canadian cards from his CFL days. Like Warren Moon, Reggie White excelled in the NFL, but got his start in another league. The USFL transfer was a 13-time Pro Bowl selection and won a title with the Packers. 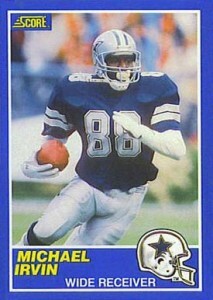 Collectors can find his rookie in 1986 Topps and it is a hard product to forget based on the vivid design. 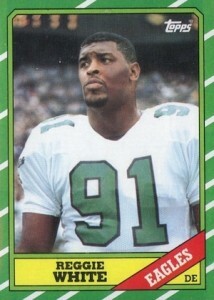 It is fortunate for Reggie White collectors that the green does not clash with the colors of Philadelphia Eagles. 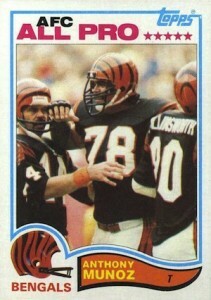 White also has an earlier card from his USFL days, and it is the most valuable among his early options. An important part of the Buffalo Bills' success in the 1990s, Andre Reed went to seven Pro Bowl games and appeared in four consecutive Super Bowl losses. Reed's rookie card in 1986 Topps has an odd look given that the red and blue colors of the Bills are surrounded by a green border. 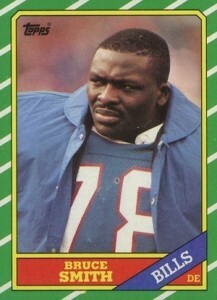 Bruce Smith was a dominant force on defense for many years with the Buffalo Bills, achieving 11 Pro Bowl appearances. His 200 total sacks still ranks as the most in NFL history. 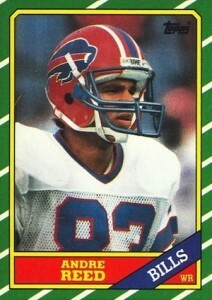 Similar to teammate Andre Reed, his 1986 Topps rookie is a little heavy on colors that don't really work well together. The face of the franchise in Buffalo during the 1990s and the catalyst for much of their postseason success, Jim Kelly is regularly mentioned among the best QBs without a title. 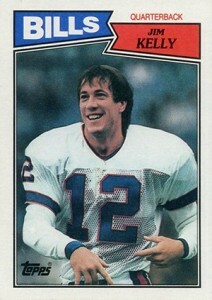 Kelly was a five-time Pro Bowl selection and his rookie card in 1987 Topps is the top overall card in the product. Prior to his NFL career, Kelly excelled during his short stint in the USFL and collectors can find a more valuable early card that was released in 1984 Topps USFL. The remaining cards on the list are all found in 1989 Score, a product that maintains solid values despite larger production runs. First up, Michael Irvin was part of the trio of stars for the Dallas Cowboys that contributed to their dominance in the 1990s. Irvin made five trips to the Pro Bowl and is very popular with collectors. Although he is not noted as rookie in 1989 Score since he was drafted in 1988, Irvin's rookie card features one of the most complete looks in the product thanks to the blue border and action shot. 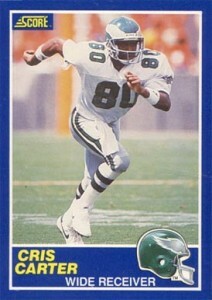 Drafted in 1987, it took even longer for Cris Carter to receive his first NFL card. After a slow start with the Philadelphia Eagles, Carter blossomed with the Minnesota Vikings, earning eight Pro Bowl trips. Not just about offensive talent, 1989 Score also offers several elite defensive options. 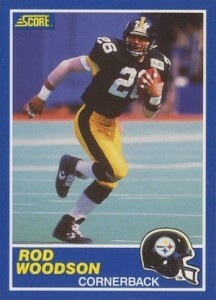 Rod Woodson went to 11 total Pro Bowls during his career and played for four teams, but is mostly remembered for his time with the Pittsburgh Steelers and Baltimore Ravens. 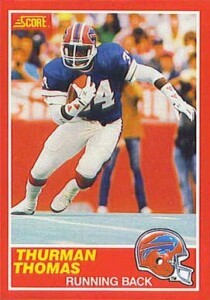 The top deal on the list based on average sales price, Thurman Thomas was another key part of the Buffalo Bills' Super Bowl streak. The rookie card for the five-time Pro Bowl selection stands out because it has a red border and most of the other popular rookies feature green or blue. 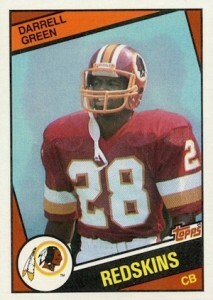 Deion Sanders marks the part of the 1989 Score set where the rookie designation is noted on the card because the players were all drafted in 1989. Sanders enjoyed a strong career for several teams, winning two Super Bowls and appearing in eight Pro Bowls. 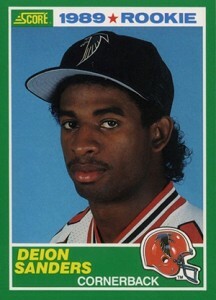 He also wins the coveted award for best haircut among all the budget Hall of Fame rookie cards in the 1980s. 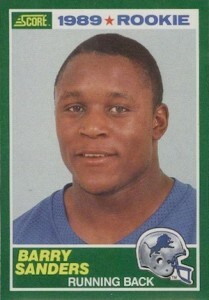 Arguably the best overall player on the list, Barry Sanders' rookie card is also the top card in the 1989 Score set. Sanders was one of the most exciting running backs in league and went to the Pro Bowl in each of his ten seasons. Despite this, his rookie can still be found for cheap. 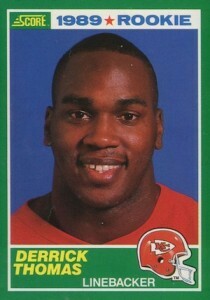 Regarded as one of the best pass rushers in history, Derrick Thomas spent his entire career with the Kansas City Chiefs, making nine trips to the Pro Bowl. His 1989 Score rookie is a very inexpensive Hall of Fame option. 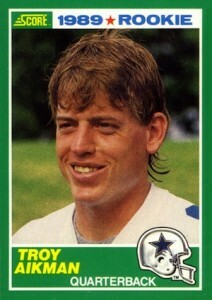 Last, but certainly not least, Troy Aikman helped lead one of the last NFL dynasties during his career with the Dallas Cowboys. The six-time Pro Bowl QB is the top rookie option after Barry Sanders in 1989 Score.